For a limited time only, you can save $55 on the Bose® SoundLink® Wireless Music System. Plus, we are including Free Express Shipping on orders over $100! 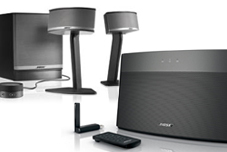 The Bose® SoundLink® promotion is available from May 2, 2010 through June 26, 2010. Your Graduate deserves the very best! Bose Computer Speakers convey a job well done.